Are you anxious about dust mites and don't you know how to get rid of them from your house? If yes, leave your worries behind and get relaxed! You will be glad to know that I have completed a mega research over the ways of removing dust mites. In this article, I am going to assist you with the ways ian which you can get rid of them from your house. So keep reading! The dust mites are the most common insects which live in your household dust. They are really too small! So, you can't see them with the naked eye. But using a microscope you can see them how the dust mites look like! You will be surprised to know that dust mites are the most common source of the reaction of allergies. Dust mites are really tiny and generally, they can be found in bedding, carpets, mattresses, upholstered furniture, and curtains! According to Jonathan Peter, the associate professor of Groote Schuur Hospital and the University of Cape Town Lung Institute, about 25% people in the world suffer from allergic rhinitis. Therefore, it's easy for you to understand that how powerful the dust mites are! About 47 different species of house dust mites have been found! Dermatophagoides pteronyssinus is the most common one of them which lives warm and muggy places in the house. Now the matter of discussion is that how to eradicate dust mites from home and you are staying here still now to know the effective ways of it, right? So, no more talks! 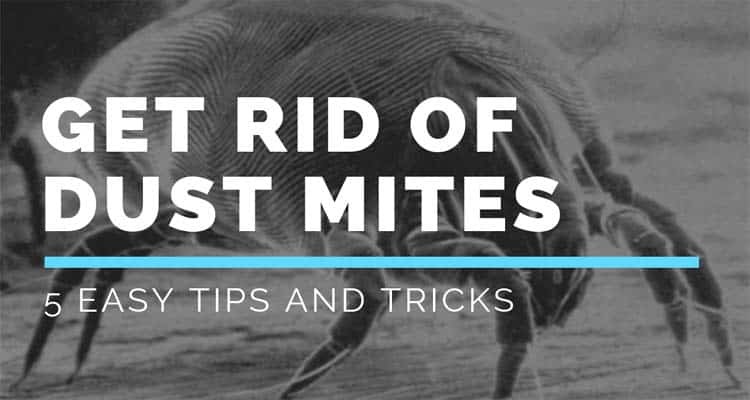 Meet the 5 ways to get rid of dust mites so that you can set free your house from the little yet mighty dust mites! Almost you spend seven hours daily in your bed, right? It means that you spend a good amount of time on the bed in a week! You need to clean the place where you spend a lot of time. If you don't then it will be an unhygienic place as well as a basic source of dust mites. In your bed sheets, dust mites get birth, live, die, and continue to grow their clan by reproducing. How can you stop them from their constant activities? According to Prof Peter research, there is one way to control them and it can be using special linen covers! Actually, linen covers are one kind of special cover which have tight gaps between the threads and it will prevent the accumulation of dead human skin cells. For this reason, the dust mites feed off and in the end, you will attain the control over the dust mites! There is another alternative method is to wash the bedding in hot water in a week! Using the way, you can kill the embedded dust mites in the sheets. Carpets are the loving place of the dust mites! If you use carpets on the floor, then it increases the beauty of your house. But you need to keep in mind that carpets collect dust and dirt! If you don't clean the carpets regularly then dust mites will take a permanent sanctuary in the carpets. You will need to invest a vacuum cleaner with a HEPA filter if you are used to carpeting in your house! By using a vacuum cleaner, the dust will not get the chance to be introduced into the air once you have cleaned the dust mites out of the carpet. Although some of the carpets are available on the market which has been impregnated with silver nitrate that helps to kill the dust mites. But I will recommend you to say "No more carpeting" if you are allergic! Clutter can reduce your productivity as well as it can increase stress! Also, it is another great cause of increasing dust in your home. There will produce more dust if you have more stuff! According to professor Peter, mostly all of the clutter leads people with allergic rhinitis. Do you want to control allergens present in your home? If yes, then you will need to do regular cleaning and decluttering your home. Decluttering can be challenging for you! For this reason, you can try to remove two items by dint of every new one when you bring it into your home! So, minimizing clutter can be the effective way to get rid of the dust mites from your house! You will need to clean all the places in your house regularly if you want to prevent dust as well as air pollution! Dusting and vacuuming can be the most useful way in which you can get control over the dust mites. Also, you can use a slightly damp cloth too for this purpose! Because it will be more conducive to remove dust from the surfaces. I believe that it will be not too easy for you to win against the invisible dust mites! At the same time, it’s really urgent to remove them from your house. Because it's a matter of your good health! Here, the most workable solution is to use a vacuum cleaner with a HEPA filter! By using it you may set free the dust particles back into the air when vacuuming is done. Smoking is one of the most common things which is greatly convicted for the air pollution! Second-hand smoke is also detrimental to you. Because you are involuntarily taking the breath with the nicotine and the chemical toxic ingredients. You will be taken aback to know that the smoke can be introduced in a harmful way in your home with carpeting and furniture. Then it is called third-hand smoke! You can't imagine that it will cause how much exaggerated for you when the smokes combine with carpets and present dust in your house. You can smoke outside to prevent the air pollution in the home! But it would be the best solution for you as well as your near and dear if you could give up smoking forever! I can feel that it's annoying for you to be regular with the dust mites! Deeply considering it I have already shared the above ways with you so you can get rid of the dust mites from your house. Did you really like the ways what I narrated above? I hope that all of the above information has been more fruitful for you to make a powerful shield after the dust mites! Most probably you are ready now to set free your house from the dust mites following the above steps! Have a great time with your clean house!